It's hard to see certain molecules react. The reaction is just that fast. Until now. A team of scientists devised a way to reveal time- and energy-resolved information on "dark" states of molecules—ones that are normally inaccessible. Their approach? They control the evolution of a highly electronically excited molecule by nonlinear optical methods in the extreme ultraviolet spectrum. This work is about cutting-edge approaches. It allows researchers to extend powerful nonlinear optical spectroscopies to the extreme ultraviolet and X-ray regime, as well as to ultra-short (less than a femtosecond) timescales. Such an extension lets scientists observe and control molecular and atomic dynamics at the fastest timescales to date. Scientists often employ nonlinear spectroscopies in the optical, infrared, and radiofrequency regimes to probe ultrafast molecular dynamics and control excited-state evolution. However, nonlinear spectroscopes have been underutilized at extreme ultraviolet and X-ray photon energies due in part to the low photon fluxes of light sources that can produce short-duration pulses in these regimes. The extension of nonlinear wave mixing techniques to the extreme ultraviolet regime promises to permit the study of electronic dynamics with unprecedented time resolution and selectivity. 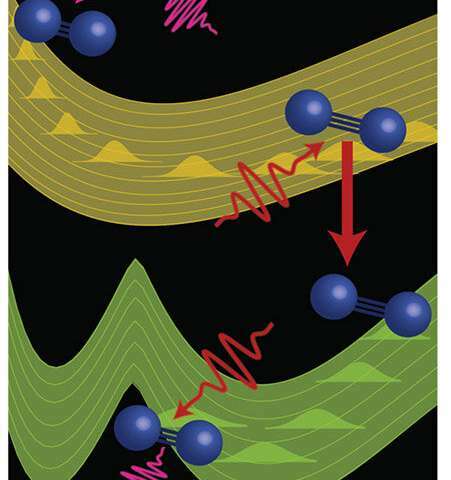 Researchers demonstrated that careful manipulation of pulse sequence and geometry can generate wave mixing signals in the extreme ultraviolet range that encode information about the energetic structure of a poorly characterized double-well dark state in nitrogen gas. Implementing a multidimensional extreme ultraviolet spectroscopy to control excited state evolution and perform highly selective measurements in molecular systems highlights the potential of such wave mixing techniques to elucidate the structure and dynamics of complex molecular systems that are difficult to study with standard linear absorption techniques. Further, the team's technique could lead to approaches to control the outcome of chemical processes and enhance low yield reactions.